Streaming music and streaming video are two types of content distribution that are pretty much old hat at this point in the life of the internet. The medium itself has become the subject of several hot button debates within music industry circles, financial discussions and band fan forums. Standing right beside this heavily talked about subject are two more, equally visited topics: Charity and crowd funding. Integrating music and raising revenue for notable causes has been a long exercised method of easily drawing attention toward a person/event/company/etc. that is in need of exposure and funds. Spanning smaller teamed efforts like Test Pressings for Charity, all the way to grand sized, live streamed concerts like Muse’s 2013 show for War Child at the O2 Shepherd’s Bush Empire and the renowned 12-12-12 Concert for Superstorm Sandy relief, this collaboration isn’t unheard of either. Despite the contrast in size and scale of these examples however, a common denominator between them is the heavily specialized and rather involved preparation/acquisition efforts required to execute such charitable events. Additionally, while getting funds to the people in need is the main focus of any charity/charitable event, virtually no fundraiser is without costs of some kind. The result of this reality is that well-intentioned events can encounter obstacles, limitations and even public backlash if a certain level of efficiency and transparency is lacking. Not to mention, the often contemplated question of, “Why can’t these types of things be put together more often?” is occasionally raised, to not much drastic alteration of the status quo. This is where the beauty of constantly launching startups makes all the difference. Injii, (pronounced in-JEE) is an online platform dedicated to raising funds and awareness for various charitable causes and organizations, with the help of A2F social interaction, fueled by musician created content. Bringing together artists and gathering input from music lovers everywhere, injii will be launching on New Year’s Day 2016 with their 24/7 broadcasting of artist contributed content. The foundation of this startup’s objectives might feel common and tried but injii brings a handful of differentiators to the startup table that break away from the existing formula of how content is presented to web surfers. User-enabled time scheduled online broadcast network (patent pending). Content producers can check availability and schedule video content to stream in real-time and their video will be shown on a network similar to television broadcasting. Anyone can reach out to injii to get involved and promote their content and charity of choice –this includes both professional up-and-coming artists and entertainers! Each piece of content presented through injii is kept to a brief and easily viewed, 2.5 minutes. The short time provides room for many more artists to be highlighted, (approx. 300 daily) as well as helping to keep viewer attention. Presently, injii’s main give back for artists in their network will revolve around their charitable support and widened access to more fans on a larger scale. However, there is a stage two launch in development, that plans to provide compensation based on the amount of traffic artists can bring to the platform. Viewers on injii will have access to a live, real-time, interactive feed: one about the artist and one about the charity the artist is supporting and what the charity does. 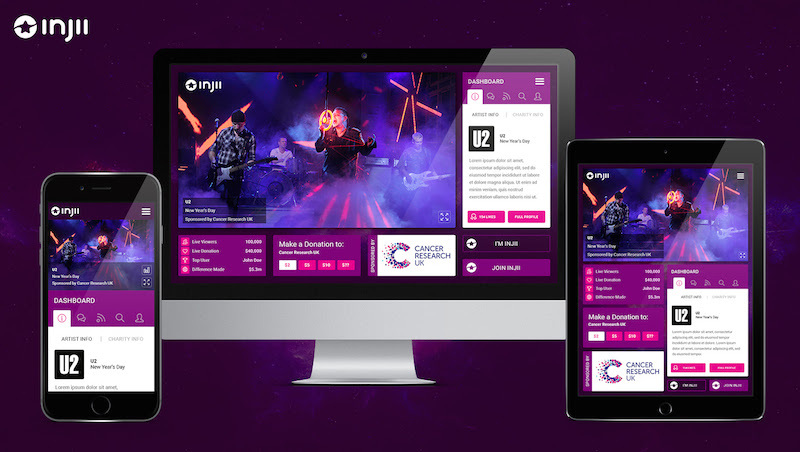 Everyone connected to the content – fans, artists and their respective supported charities – can all communicate with one another. Dialogues can be started, funds can be donated and A2F relationships can be sparked. Viewers can donate however much they want to the charity. Additionally, the more funds donated, the more rewards viewers can receive! The bottom line of cost and practicality is sure to come to mind and the biggest pair of differences for injii is its exclusivity-tinged element: content is broadcast but not archived, as well as being free for both artists and viewers so this isn’t about just copying and pasting an existing code to a third-party site. Then, where money comes into play, is only for donations to the charities, which is injii’s entire focus of importance. Percentages of donations lost in conjunction with fundraisers is a long-held weakness of these methods, as explained by injii CEO and founder, Justin Paul. The slimming down of expenses needed to get attention and money to a charity via music-centric appeal helps improve the problem of lost funds. Furthermore, inclusion of charitable awareness infuses the massive amount of time spent watching content, with a humanitarian and positively intentioned base. Check out this promotional video on injii and ahead of its New Year’s Day launch, consider backing its fundable.com campaign (HERE), which is geared toward “expanding its server infrastructure and supporting the ongoing development of its free online charity benefit content.” The campaign includes several tiers of backer perks and will run for the next 27 days. Artists and fans interested in joining injii can sign up through their homepage.